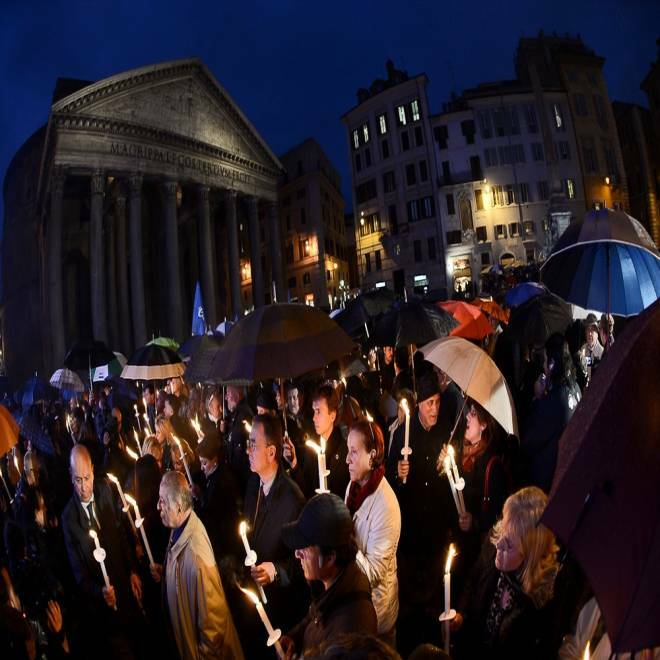 Italians hold candles as they demonstrate against government policy in front of the Pantheon, in downtown Rome, on April 18, 2012. Trade union's anger is growing in Italy over the government's reform measures and public outrage over a series of suicides linked to the economic crisis. ASOLO, Italy – On Tuesday, Generoso Armenante, a 49-year-old former security guard at a convenience store in the southern town of Salerno, left home after having lunch with his wife – and quietly found a secluded spot where he hanged himself. Unfortunately, he is not alone. Tens of other Italians have also chosen to take their own lives in response to the strain of the economic crisis and the consequent austerity measures. On Tuesday, two other people committed suicide, apparently due to financial hardship. A 60-year-old businessman in Milan hanged himself from a tree after failing to repay his debts. The three men are casualties of the debt crisis that has pushed Italy’s economy to the brink over the past year and put considerable strain on most Italians, especially those who own or work for small businesses. At least 34 people have killed themselves citing economic reasons since the start of the year, according to the Italian Association of Small Businesses. A dramatic hike in taxes, combined with large cuts in public spending, a clampdown on tax evasion and a credit crunch from banks have pushed many Italian businesses to the brink of bankruptcy. Some have stuck to the old Italian script, griping about the government measures at the local cafe over a cappuccino and hoping for better times. But others have seen no way out, and have opted for death. The most affected region is the relatively prosperous Veneto in the northeast of Italy, home of Venice and an abundance of businessmen. Tiziana Marrone, right, widow of Giuseppe Campaniello, whose his picture is carried on a banner in background, and Elisabetta Bianchi take part in a demonstration to protest against Italian Premier Mario Monti's austerity measures, in Bologna, Italy, on Friday, May 4, 2012. Marrone and Bianchi claimed that their husbands committed suicide because of economic crisis. In a part of the country that has had a reputation for skilled merchants since Venice was a maritime republic, as many as one in 10 own their own business. Some of the most recognized Italian brands, such as Benetton and Diesel, originate from the area. This feeling of failure and loneliness is at the very heart of acts of desperation among the business community in Italy. The message left by Armenante, the security guard who hanged himself on Tuesday is the same mantra repeated by workers and businessmen who either tried to kill themselves and lived to tell the tale or by those who thought about trying, but found other reasons to live. Giovanni, who is in his mid-40s and also lives in Asolo, admits that he thought about ending his life after failing to repay a debt of $25,000. The self-employed plumber, who asked that his last name not be used, told NBC News that he only stopped himself because he didn’t want his family to pay for his mistakes, adding that he has a disabled son and a wife with a history of psychological problems. “It was a dark moment, and I thought there was no way out,” he said. “They strangled me economically; I just can’t keep up with repayments. I got to the point where I couldn’t go back home and look at my wife and children in the eyes, and tell them I didn’t know how to carry on,” he said. To help ease the problem, a workers’ association near Asolo started a helpline for people in distress. They received at least 60 calls in their first two months of activity, but say that it’s worried families who tend to call rather than the businessmen themselves. Zanatta says that he expected a dramatic hike in the number of calls during the month of June. That’s the deadline for filing tax returns in Italy, and the time when many businessmen may realize they just can’t survive the economic crisis.